One thing I’ve noticed a lot in these new adult years is that people, some more than others, have a really bad habit of saying things they either don’t mean or they will never follow through on, even if they did mean it. And I’d like it to stop. Of course, it’s a thing that people probably don’t even realize they’re doing it, so it’s hard to change, but if I may, I’d like to suggest that in your next social conversation, try to notice it happening. Listen for it from all parties. You may be surprised how often it happens. It happens at work, I’ve noticed as well. Because you never know when you’ll be talking to someone (me) who takes everything to heart (me) and then bases her self worth over it (me). Okay, that’s dramatic, but the point still stands. I’ve had friends say something like “you’ll have to come to my cottage this summer!” and then I’ll never get an invite, or “you’ve never seen [insert some old Disney movie here]? Okay, one day we’re gonna watch it together!” and then we don’t. Do you know how many friends over the years have said, “I want to straighten your hair! We’ll have a sleepover and I’ll straighten it!” At least three. Do you know how many actually followed through? Zero. Not that I want my hair straightened, I’m just saying. My best friend and I have for years talked about going to London, England one day. But we never made plans or set deadlines or made it seem like it was realistic for us any time soon. Even now, I in theory could go given that I have a job and vacation time, but my friend is still in school, so it’d be dumb to do that, and we’re not in a rush. If we ever talk about it these days, it’ll still be in that future idyllic sense so we know we’re not letting anyone one down because we’re reasonable humans. I know it’s probably my fault for believing these grandiose plans and letting the constant failure of them get to me, but I also think the world would be better if we were more honest and realistic about things we say and do and think. And I’m realizing that maybe I sound bitter and projecting my social life insecurities into this post, but it’s not just fellow young people around me doing it. My parents do it with their friends for things not even involving me. I just watch it happen (or not happen, I should say). It’s so easy to say “we’ll do this,” and “we’ll do that,” and “I’ll totally invite you here,” and in my heart I know that people more often than not actually do want to follow through, but they either forget they said it or things just don’t work out. So I guess my point is if you notice this being a pattern in your life, maybe think twice about so casually saying something because holding back certainly won’t hurt. 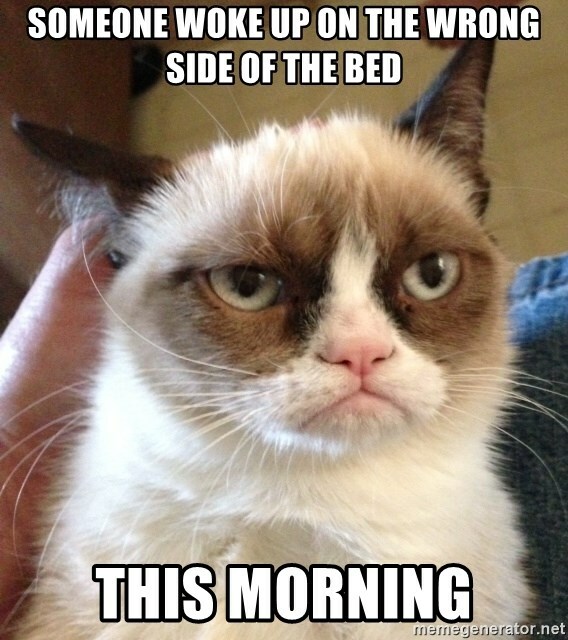 We’ve all heard the cliche saying of “Seems somebody woke up on the wrong side of the bed!” whenever someone is being grumpy and irritable. A lot of phrases like that are just old superstitions, and I know this. But still, I figured it’d be fun to try to test it by getting up on different sides of the bed. Because I can. My bed at home is in the middle of the wall, so I actually can do this, whereas all through university, my beds were against a wall, so I only had one way out. I always get out on the left side, because my nightstand is on that side, as is the door. But who’s to say that’s the proper side? Maybe my life would really pick up if I changed it up. So for two weeks, I tracked what side of the bed I got up on in the morning and then how I felt the day went at night. I had to wait until I had two weeks where I didn’t have anything big going on that would cause my days to have biased emotions. I also didn’t want to just go right-left-right-left-right back and forth, so I allowed myself to change it up randomly (though I often forgot to think about which side and I’d remember after I got up, so sometimes my randomness was more like forgetfulness…) and I’d just have to remember to write it down. I did track it on a piece of paper, but it was messy and hard to read, so I recreated the chart on good old MS Paint. Anyway, sometimes science comes to anticlimactic results, and this is one such example if we’re so bold to call this science. I hope you enjoyed reading it at least. And feel free to test it yourself! Why the heck not? Prove lady fate wrong or right. It really wasn’t hard to do, as long as I remembered to do it as I was getting up. What side of the bed do you get up from? I recently did some blog housekeeping. I unfollowed a bunch of inactive blogs and Twitter accounts and visited the blogs of my followers to find that they’re also mostly inactive. It’s not the first time I’ve done this, though I really should do it more often because it literally took me all weekend. The last time I did this, it spurred this post about empty followers and how they really take a toll. This time, the chore brought on the following thought explosion. And I get it, life can be crazy. I only blog once a week and when I clock out at work, I have essentially zero responsibilities or plans, but even I have trouble keeping up sometimes. I am in awe of people who balance blogging and a more busy life. But I’ve made blogging work for me, and that’s not because I’m special or love writing more than others. I’ve noticed that blogging has become more about just writing online. It’s become a process. You can’t just post when you want. You have to have a schedule. You have to network. You have to have social media accounts. You have to have great content. This side of blogging is huge, and it’s very easy to get sucked into it. Blogging, for a lot of people, is a part-time job, and that can’t work for everyone. Even me with my free time, I don’t have the time to do everything….nor do I have the drive. Blogging is fun for me, and I don’t want the stress of upkeep and goals ruining it for me. I’d love to know how many people with inactive blogs quit because they couldn’t keep up with the demands bloggers have placed on each other. Or how many felt so guilty for taking a break that they don’t come back at all. I’ll admit that sometimes, the pressure to post and be active on social media has helped me because it forced me to be productive at times when I didn’t want to, but it also makes me feel a bit guilty for sometimes considering a week off or not tweeting as much as I feel I should to build a brand. But overall, since I only post once a week and only focus on a few social platforms, I’m not as overwhelmed and stressed. See, blogging for me is a hobby. I like to write and share my nonsense. I doubt I’ll ever get so popular that my blogging will ever be anything but a hobby. Almost all bloggers start doing it as a hobby (honestly if you go into it for any other reason, you’re a fool), but there’s this push in the blogosphere to eventually transition to a full-time blogger. I see a lot of young ladies quit their jobs to blog full time. They’ve got the passion and drive and obviously better stats than me, so they take on the work-from-home freelance hustle-hard life, and I respect that because it does take balls. I could never do it. And I shouldn’t. We can’t all blog full time and we can’t all have companies wanting to work with us and we can’t all be invited to events. And I wouldn’t want to anyway, because if I’m always so concerned about making money and what post will do that, I won’t be able to post the nonsense I like. This happens outside of the blogging world, of course. A friend on Facebook shared this article a few weeks ago about why turning a hobby (blogging, sewing, jewelry-making…) into a career isn’t always the best path because it can lead to resentment and a dislike for what was once a passion and an escape. At least YouTube has a system to pay big creators, but other industries don’t have that. So you gotta work really hard to make what you would at a regular job with benefits and whatnot. If there are any new bloggers reading this, I urge you to find a schedule that works for you and draw the lines if you want to maintain blogging. Don’t get pressured into what others think blogging is because it’s a battle that may cause you to lose a passion. If you like to write and are fine doing it for no other reason, then great! Welcome to the blogosphere. Blogging isn’t for everyone, but it may be for you.